I started using PVC pipes to make my trellises in the garden, but have sense learned that PVC has Phthalates which are xenoestrogens. My concern is that xenoestrogens are chemicals similar to estrogen and act more aggressively in our bodies than our own estrogen. When a women has high estrogen in relation to her other hormones she is at higher risk for breast cancer and cancers of the uterine, cervical, ovarian, etc. Men can be at a high risk for cancer of the prostate when their estrogen (yes men have estrogen too) is high in proportion to the rest of his hormones. Needless to say I don't want it in my garden anymore! I wrote a post about how to keep xenoestrogens out of your garden if you want to learn more. So what to do with all those PVC Pipes? We have like 20 6 ft pipes, and 10, 4ft pipes. Hmmmm... I'm still contemplating what I will make. Of course I'll post when I do make something with it. But I have found sooo.....many cool ideas I'll have a hard time picking. I'd thought I'd share it with y'all! The ways you can use PVC are only limited to your imagination. It's truly mind boggling all the ways people have come up with to use it. Here are some ways I have seen it used I thought were clever. Home: garment rack, wine rack, shelving unit, wall art, a bed, etc. For this article we will look at ways to use PVC for gardening and outdoor living. Be careful while thinking of ideals from using PVC in your garden that you do not add xenoestrogens as stated before. There are some great ideals I have seen that unfortunately I will not do for this reason, such as hydroponics garden, drip irrigation and sprinklers, or tomato cages. Anything where the PVC would come in contact with a plant you plan to eat. Now if your gardening just for pretty flowers that's a different story. 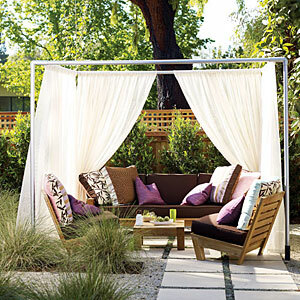 The PVC ideals I am most excited about are creating an outdoor cabana, a green house, cold frames, grow rack, playhouse, garden hose holder, hoop house, chicken pasture pen, outdoor camp chairs, and an outdoor movie screen. I hope these links will inspire you to create some fun stuff in your garden this spring and to create cool outdoor living spaces to enjoy this summer. How cool is this green house? I found a few great ones on this great site that has free PVC plans pictured above. I already made a grow rack out of a small metal greenhouse, but I would so have made one out of PVC had I not already had one, or do I need another? 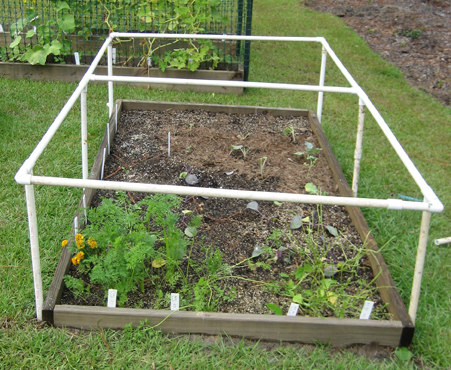 I could always make a cold frame to fit over my existing garden bed squares (our garden is made of 8 squares of 5ft X 3ft). 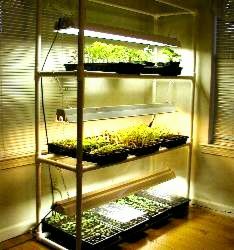 I could make two cold frames to put over two squares in my garden in the fall. The cool thing is that unlike making a cold frame out of wood or old windows it would be easy to put together and take apart for storage. 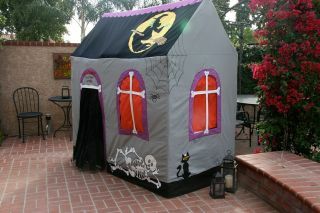 I'm leaning towards using our PVC for this, unless I have another cool ideal. Below is a picture of the closest I could find that I am thinking of. 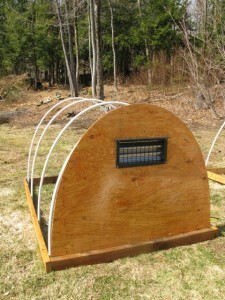 Another option is making a hoop house which is also pictured below. Probably one of the coolest PVC ideals is an outdoor movie screen. I don't know if I'll ever do this myself but maybe one day. How fun would that be for outdoor barbeques and parties? I also like the log benches! If you read this blog you probably know we do not have chickens, maybe one day but we have no plans to anytime soon. So I won't be making this for myself, but I know many of our readers do have chickens so I thought I would share this PVC pipe chicken pasture pen from pvcplans. I would so make this if we had chickens! They have free plans at the link on the caption to make this. 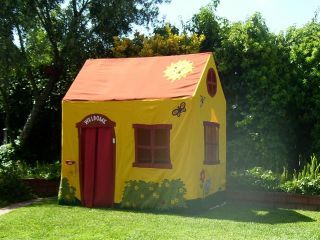 How cute is this playhouse for kids? Maybe for my 4 year old niece? 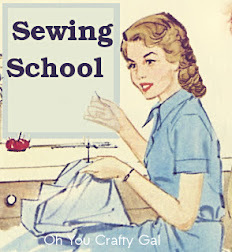 They don't have exact plans but they have pictures of the structure so it should be easy to figure out and use fabric pants on the fabric. You could even make different covers like Denise the designer did. I think it would be cool to turn it into a haunted house or princess's castle. This one is just for fantasy unless you have a ton of land, which I don't. 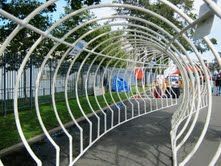 But how cool would this tunnel be with wisteria or some other vines growing on it, it could even have pole beans! I hope these ideals get your own creative juices flowing I know they have for me! Dreaming of Concrete Blocks: Raised Beds, Planters, Benches, and Tables Oh My!